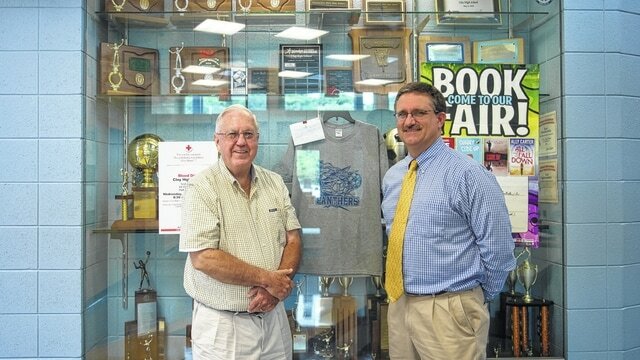 Submitted Photo | Daily Times Charlie Leonard, Clay Alumni Rep and Past Alumni Chair and Todd Warnock, CHS Principal. The Scioto Foundation has announced the three local school systems who won UCAN 2.0 matching challenge grants for the 2014 – 2015 academic year. In addition to offering endowment building matching grants to 12 Scioto County school systems at a 1:2 ratio for the past school year, the Foundation’s extension of its UCAN (University/College Access Network) program gave participating school systems the opportunity to compete for additional challenge grants. The award for the school that raised the most money for its endowment fund invested at the Scioto Foundation goes to the Clay Local Schools this year. Clay raised $15,000 through the efforts of its alumni association and the schools. Along with a $10,000 match from the Scioto Foundation, they earned a total of $25,000 to add to the Clay Local Schools Legacy Scholarship Fund. The Clay Alumni Association depends on two major fundraisers each year to raise scholarship funds for its endowment, according to Treasurer Charles Leonard. A large alumni banquet held each July and the Clay Christmas Craft Bazaar, scheduled this year on October 31, have enabled them to make the Clay Local Schools Legacy Scholarship Fund the largest UCAN endowment fund invested at the Scioto Foundation. The Clay Alumni Association awarded fourteen $1,000 scholarships to Clay graduation seniors in 2015 and could have given more if there had been more applicants, said Leonard. volunteers who go to make up our winning Clay alumni team for each person’s contribution that made it possible to win this additional $5,000,” said Leonard. A $2,500 award went to the Green Local Schools who had the highest percentage of employees giving to their UCAN endowment fund through payroll deductions. In Green’s first year of giving through the payroll deduction plan, the school system achieved staff participation of 60%. Guidance counselor Amanda Sherman and Treasurer Brodie Merrill led the efforts to initiate Green’s new payroll deduction plan. South Webster’s Bloom Vernon Schools also won an award of $2,500 for having the highest participation rate of students taking AP courses. Forty-two percent of Bloom Vernon’s junior and senior class students were enrolled in AP classes in the 2014-15 school year. Five school systems participating in UCAN 2.0 earned the maximum challenge grant match for 2014-2015. They were Clay, Minford, Notre Dame, Portsmouth and Wheelersburg. UCAN 2.0, an extension of the Scioto Foundation’s UCAN (University/College Access Network) program to help Scioto County students plan, prepare and pay for college, is in its second year, according to SF Executive Director Kim Cutlip. UCAN 2.0 offers endowment building matching challenge grants to 12 Scioto County School systems at a 1:2 ratio. The total Scioto Foundation pledge for the three-year period, which began 9/1/13 and will end 8/31/16, is $210,000 with a $5,000 maximum challenge grant available to each participating school district each of the three years. Through the UCAN program, The Scioto Foundation continues to support college preparedness efforts through teacher education stipends for those who attend Shawnee State’s Advanced Placement Summer Institute and $1,000 mini-grants to local schools to assist with the costs of exam fees such as AP, ACT, PSAT and others, said Cutlip. The Scioto Foundation’s programs supporting the culture of a college-going community also continue with a UCAN Go To College Night set for October 13 at the SOMC Friends Center and a UCAN Go To College Carnival for pre-school through 3rd graders planned for the spring of 2016. Additional information about the Scioto Foundation’s UCAN program may be obtained by contacting Cutlip at (740) 354-4612 or kim.sciotofoundation@frontier.com.